We will be comparing respective variants priced the closest for a fair comparison. Let’s see which one offers better value for your money. 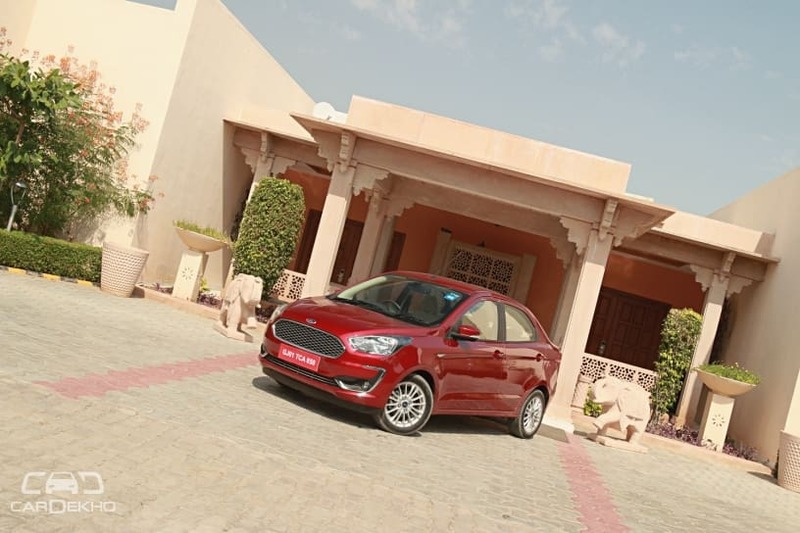 Ford has launched the 2018 Aspire facelift in India at prices starting from Rs 5.55 lakh, going up to Rs 8.49 lakh (ex-showroom India). 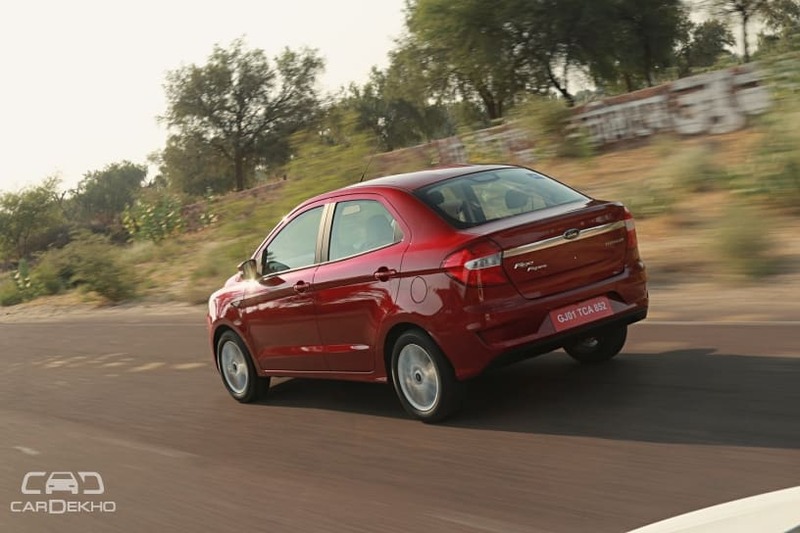 Besides the price cut, the 2018 Ford Aspire facelift’s feature list has also been updated, thus helping it make a stronger case for itself against the Maruti Dzire which is priced from Rs 5.60 lakh to Rs 9.45 lakh (ex-showroom Delhi). Additional features in Dzire over Aspire: LED tail lights, gear-shift indicator, ISOFIX mounts, bottle holders on rear door pockets. Verdict: These are the barebones versions of the two sedans, but if you are on a tight budget, the Aspire Ambiente that makes more sense. 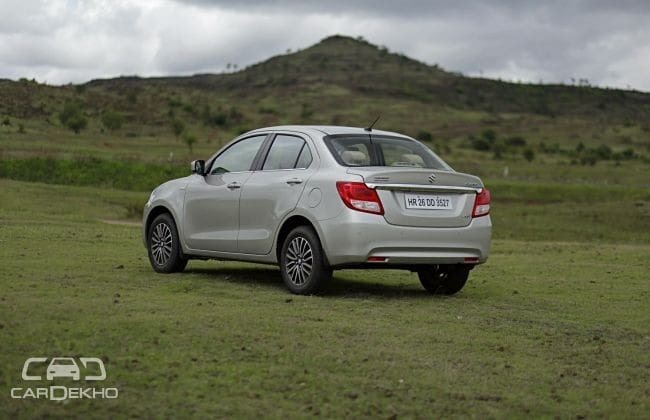 Not only does it get more useful features at a slightly lesser price, but both of its engines are more powerful than the Dzire’s too. The Dzire should only be your pick if you have small children in the family and will be using ISOFIX mounts for child seats. 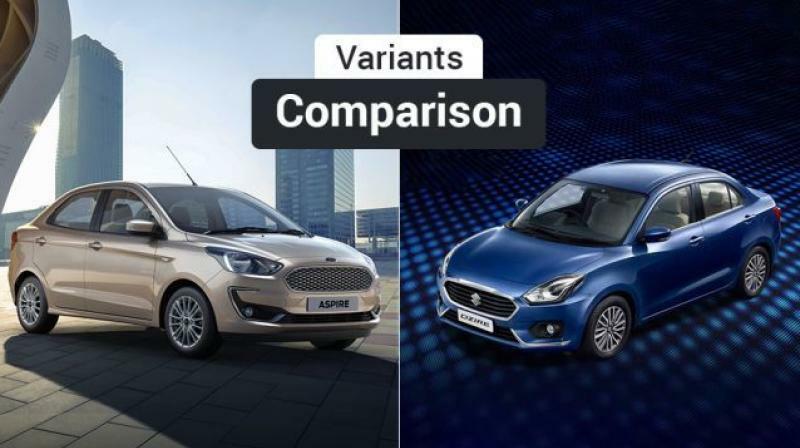 Common features over previous variants: Since we are past the base variants, both the cars are decently equipped and get body coloured door handles, electrically adjustable outside rearview mirrors with integrated indicators, wheel covers and central locking. On the inside, you get adjustable front headrests, passenger-side vanity mirror, day/night IRVM, all-four power windows, tachometer, four-speaker audio system with USB, AUX, Bluetooth, radio and steering-mounted controls, along with steering-mounted climate control buttons, rear centre armrest and boot lamp. Verdict: Here again, it's the Aspire that is the more sensible buy as it gets a longer list of features. Sweetening the deal further is its cheaper price tag. Common features over previous variants: Chrome front grille and rear applique, front fog lamps, rear defogger, 15-inch alloy wheels, electrically foldable ORVMs, push-button start/stop, driver seat adjustment, climate control, front and rear accessory socket with speed-sensitive door locks. Additional features in Aspire over Dzire: Being the top-spec Aspire, it packs auto headlamps, a 6.5-inch capacitive touchscreen infotainment system with SYNC 3, emergency assistance, voice command and Apple CarPlay with Android Auto as well as rain-sensing wipers. There are a total of a whopping six airbags which are not even optional on the Dzire. Additional features in Dzire over Aspire: Tweeters and leather wrapped steering wheel. 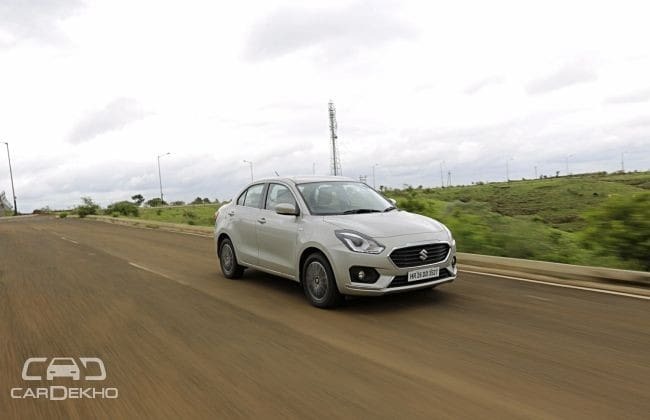 Verdict: It's the top-spec Aspire against the second from top Dzire variant and as you’d expect, it’s the former that comes on top with the touchscreen, additional airbags and some more features. The Aspire is a bit expensive, but the additional features justify the extra cost. Common features over previous variants: Auto headlamps, touchscreen infotainment system with Android Auto and Apple CarPlay connectivity with reverse parking camera. Additional features in Aspire over Dzire: Rain-sensing wipers, emergency assist, side and curtain airbags, safety suite of HLA (hill launch assist), ESP (electronic stability program) and TCS (traction control system). 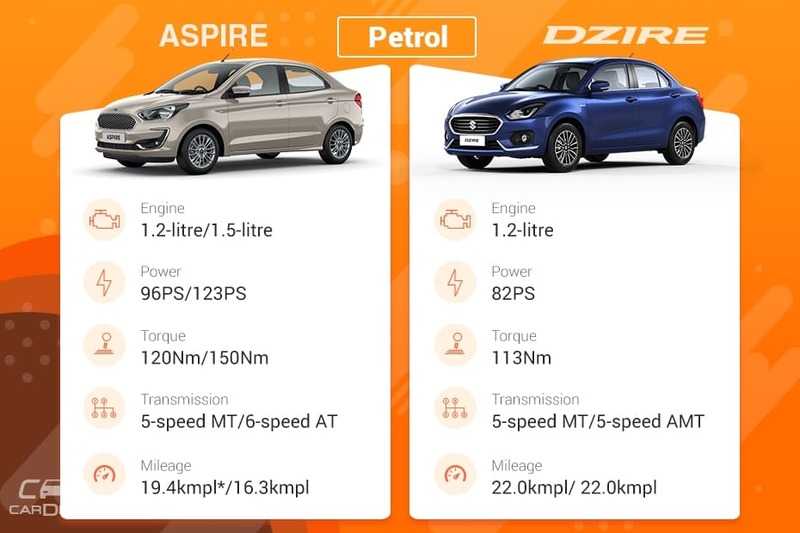 Verdict: Both the cars are priced similarly, but it’s the Aspire that edges past the Dzire again by offering more safety features.